Alfred Joseph Casson (Canadian, 1898–1992) began his art career as a freelance commercial designer in Toronto, where he met and worked with Franklin Carmichael. The two shared an interest in watercolours and went on sketching trips together, and would later found the Ontario Society of Painters in Watercolour with Frederic Brigden. 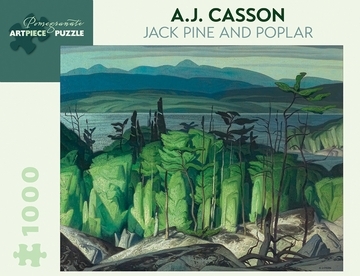 Casson was invited to join the Group of Seven painters in 1926. He accepted, becoming the youngest member. He established his own voice within the Group by choosing small towns and rural settings as subjects for his paintings, and enjoyed a long career as a respected artist. Casson died in 1992 at the age of ninety-four and is buried alongside other Group members in the cemetery on the McMichael Canadian Art Collection’s gallery grounds.